From plastic baggies and metal tins to fancy pouches and customized exit bags, cannabis packaging is evolving quickly. Today, nearly half of the United States allows some form of legal cannabis sales, and cannabis companies are utilizing vibrant packaging to catch the eyes of their new customer base. An important, yet often-overlooked, feature of good cannabis packaging is its ability to keep the product fresh. Cannabis is subject to spoilage problems, like that of premium fresh herbs. What good is the packaging if the contents are limp, brittle, or moldy? The best industry to look to for cannabis packaging solutions is the food industry. For decades, the food industry has been working to solve freshness problems with innovative packaging solutions. One of the most promising techniques for cannabis companies is a process called nitrogen flush packaging. 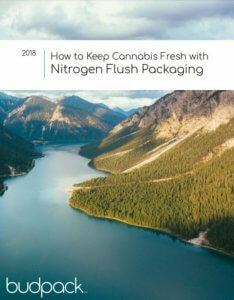 Nitrogen flush packaging can be used to keep cannabis dry, fresh and potent, while still delivering the vibrant graphic space and user-friendly features of the popular pouch.